Who's playing in round one? Join Sarah Allen and Neil Balme as they present the Collingwood line up for Saturday's match against Sydney on the first episode of Team Sheet for 2016.
Who's playing in round one? 17 AFL-listed players have helped Collingwood comfortably defeat Coburg in a VFL practice match at the Holden Centre. Ben Reid, Jonathon Marsh, Alan Toovey and Jesse White were vital for the Magpies in defence, while a host of teammates added to Collingwood's final score of 16.8 (104). In a game that was always one-sided and often lacking in intensity, the Pies' AFL-listed players were always the focus. Tyson Goldsack and Rupert Wills sat out the early stages of the game, with both immediately impressing once entering the game. Goldsack went forward and kicked a goal within minutes of taking the field, while Wills amassed a number of disposals in the second half. James Aish kicked three goals from his position on the wing, while rookies and former Oakleigh Chargers teammates Tom Phillips and Ben Crocker kicked two goals each. There was only 10 of them, but they were influential none the less. Perhaps impressing the most was 19-year-old Bendigo recruit Marty Hore. Wearing the number 70, Hore marked well and showed clean disposal playing at half back. 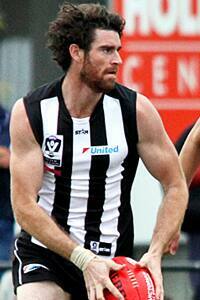 Nick Gray was the only VFL-listed Magpie to kick a goal, with Jack Blair busy in the forwardline. Lachlan Ferguson and Jeremy Taylor came on in the latter stages of the game, both taking the field for the first time this season. With his knee heavily strapped, Taylor had a handful of touches at half back while while Ferguson wound back the clock to 2014 in his first game after a year away from VFL football. Collingwood will conclude its VFL pre-season with a trip to Geelong next Saturday. Review Collingwood Media's live play-by-play commentary of the game in the module below. Collingwood has named a star-laden VFL team to take on Coburg in a practice match at Olympic Park on Saturday afternoon. Senior names such as Alan Toovey, Brodie Grundy, Ben Reid, Tyson Goldsack, Jeremy Howe and Jesse White will all look to use the game as an opportunity to press their claims in the eyes of the match committee. At the other end of the scale, players such as Jonathon Marsh, Adam Oxley and James Aish headline a group of youngsters hungry to impress and force their way into the senior team. The match will also feature Rupert Wills' first match of any kind since he was drafted last November. The former VFL Magpie did not appear during the NAB Challenge, but will pull on the jumper for the first time since last winter this Saturday. Members and supporters are encouraged to make their way to the game, which will feature four twenty-minute quarters plus time on.